MilliOnAir has showcased female global online mentors who split their time between filming their latest work and setting their next challenge, to the business leaders who travel the world promoting their brands, sharing their passion and notable charity work. These individuals, who in some cases have gone from start-up to being highly successful, are today’s industry pace setters and role models. 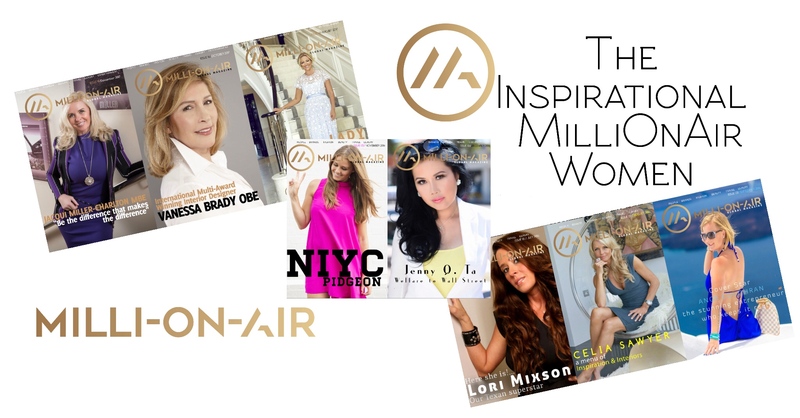 In January edition we get to say ”Thank you” to eight of the most inspirational women who have graced the cover of MilliOnAir Global Magazine. Celia was in our August issue, we met her in her plush Mayfair office and were blown away how wonderful and down to earth she is. We can’t wait to catch up with her again in 2018. Ange inspired us all here at MOA and it was all with her online creative skills and business savvy ways, she will always have a place in our hearts and in MOA. ”I started my first business aged 23 without planning it, without thinking it up, it just happened. We got her pink dress, we got her book and we got her on the front cover…yay! We love you NIYC! ”As a Positive Psychologist and Success Coach, I’m on a mission to help a million women change their lives using positive psychology by the year 2020. What more can we say about Jenny? Read her story…She is just a true inspiration to us all. ”Lady Mone, Baroness of Mayfair OBE, is one of the UK’s leading entrepreneurs and global speakers. We were over the moon when we got to interview Vanessa, she is amazing, talented and such a wonderful person. We have met Jacqui a few times, she is a ”wonder business woman!” Watch out for her at the Newcastle Film Festival in 2018! ”A business professional with over 34 years of operational experience. Active leadership in the areas of sales, marketing, brand creation, commercial negotiation, business development and international growth strategy.